In politics, the Third Way is a position akin to centrism that tries to reconcile right-wing and left-wing politics by advocating a varying synthesis of right-wing economic and left-wing social policies. The Third Way was created as a serious re-evaluation of political policies within various centre-left progressive movements in response to international doubt regarding the economic viability of the state; economic interventionist policies that had previously been popularized by Keynesianism and contrasted with the corresponding rise of popularity for economic liberalism and the New Right. The Third Way is promoted by some social democratic and social liberal movements. 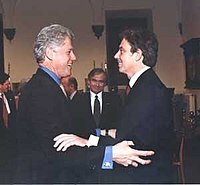 Bill Clinton and Tony Blair, early adherents of the "Third Way"
Manuel Valls and Matteo Renzi, contemporary political leaders considered to follow the "Third Way"
Major Third Way social democratic proponent Tony Blair claimed that the socialism he advocated was different from traditional conceptions of socialism. Blair said "My kind of socialism is a set of values based around notions of social justice ... Socialism as a rigid form of economic determinism has ended, and rightly". Blair referred to it as "social-ism" that involves politics that recognized individuals as socially interdependent, and advocated social justice, social cohesion, equal worth of each citizen, and equal opportunity. Third Way social democratic theorist Anthony Giddens has said that the Third Way rejects the traditional conception of socialism, and instead accepts the conception of socialism as conceived of by Anthony Crosland as an ethical doctrine that views social democratic governments as having achieved a viable ethical socialism by removing the unjust elements of capitalism by providing social welfare and other policies, and that contemporary socialism has outgrown the Marxian claim for the need of the abolition of capitalism. Blair in 2009 publicly declared support for a "new capitalism". It supports the pursuit of greater egalitarianism in society through action to increase the distribution of skills, capacities, and productive endowments, while rejecting income redistribution as the means to achieve this. It emphasizes commitment to balanced budgets, providing equal opportunity combined with an emphasis on personal responsibility, decentralization of government power to the lowest level possible, encouragement of public-private partnerships, improving labour supply, investment in human development, protection of social capital, and protection of the environment. The Third Way has been criticized by some conservatives and libertarians who advocate laissez-faire capitalism. It has also been heavily criticized by many social democrats, democratic socialists and communists in particular as a betrayal of left-wing values. Specific definitions of Third Way policies may differ between Europe and America.